Guitar learning in this technical modern age can be enhanced greatly with the wealth of software and applications that are available to you. In conjunction with me lessons I have found it extremely useful to use the following software and applications to enhance my students enjoyment and progress. 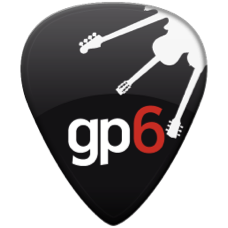 Guitar Pro 6 - Electronical tablature software, this software allows you to play tabs and write your own music. It uses midi to produce the sound of the guitar allow you to hear exactly how a song should sound. There is a library of songs available online for you to download free of charge. I will use this software to provide the student with tablature from lessons. This allows you to keep all your lesson material on your computer in one place. Nine Buzz Jam tracks - This app has great quality Jam tracks in various musical styles from blues to rock. You can also choose which key you would like and whether you want a major or minor tonality. This app also shows you the chords that are played in the backing and also shows you the recommended scales that can be played over the track. This is a must get application for any guitar player practising scales or improvising. Slick metronome - A good and versatile metronome that has a lot of options in tempo and time signature. GStrings - A guitar tuning app, this tuner is very responsive and will allow you to tune to an note. This is also a free application.